Join us for Craft Night on February 7th from 6:30-8:30PM! 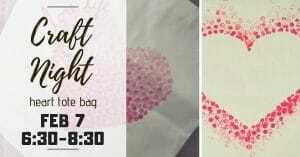 We will be making a Heart Tote Bag ♥ Your $35 fee includes: -all the supplies necessary to complete the craft -2 glasses of wine -your unique craft to take home -instruction from Megan Sign Up Here! **cancellation policy: full refund 7+ days before event,..